Several players held the NFL’s all-time reception mark after 1970. Don Maynard, Charley Taylor, Charlie Joiner and Art Monk are among the names who claimed the title before Jerry Rice. Steve Largent is another receiver who held that distinction. Largent made his way to the Seahawks by happenstance. The Houston Oilers drafted Largent in the fourth round of the 1976 NFL Draft. He didn’t impress the Oilers, and found himself on a bus headed home to Oklahoma after four preseason games. He thought his football career was over. Jerry Rhome, a Seahawk assistant coach, had coached Largent in college at Tulsa. Rhome convinced the team to give Largent a second chance. The expansion Seahawks traded an eighth-round pick in the 1977 draft for Largent’s rights. Largent made the Seahawks front office look like geniuses. Don’t be too quick to praise the brilliance of Seattle’s front office. They followed up the Largent heist by trading their 1977 first-round pick to the Dallas Cowboys. The Cowboys drafted Tony Dorsett with the second-overall selection. The Seahawks scored multiple draft picks in the deal, but drafted no one of NFL significance. The thought of Tony Dorsett and Steve Largent on the same offense is enticing. Might they have challenged for the AFC title with the Hall of Fame duo on offense? A second double threat would have paired Earl Campbell with Largent, if the Oilers had held on to Steve. The Oilers had several playoff opportunities, and faced the Steelers in two straight AFC Championships. Perhaps Largent would have put the Oilers over the top, especially in the much closer second matchup. Whether Largent would have pushed the Oilers further in those years or not, he certainly would have finished his Oiler career with Warren Moon. Although the Oilers didn’t become top contenders until after Largent’s retirement, Moon-to-Largent would have shaken a few AFC secondaries. Had the NFL expanded by adding the Seahawks and Tampa Bay Buccaneers in 1977 rather than 1976, the world outside of Tulsa, Oklahoma might never have heard of Steve Largent. 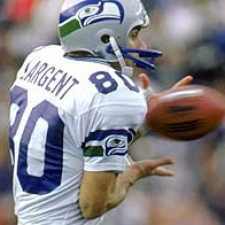 Largent retired the NFL’s all-time leader in receptions, yardage, and touchdowns. Interestingly, he never once led the NFL in receptions or touchdowns in a single season. In fact, he never placed higher than third in receptions, a feat he accomplished only once. His next highest finish was sixth. Still, both fans and opponents highly respected Largent’s talents, and the Pro Football Hall of Fame made an inarguable decision to enshrine him. The Houston Oilers, however, weren’t nearly as wise.